"For the past four years, Adullam Films has been developing a documentary series called "Megiddo: The March to Armageddon." Believing we are called to this by God, we have been immersed in research and have conducted original on-camera interviews with some of the leading authors & researchers in Bible prophecy and its fulfillment in the world today. Part One: Bible Prophecy & The New World Order is now available. An additional four parts are planned to follow, each of them exploring the new age/new world order movements that are instrumental in gathering all nations to the Valley of Megiddo, and the great day of God Almighty prophesied throughout the Old and New Testaments. Megiddo reveals how God uses prophecy to prove His existence and to separate Himself from all others that claim His authority. This informative documentary also chronicles startling quotes from powerful men of history who have spoken of the need for world government to further the cause of peace. But what does the Bible say about ï¿½world peaceï¿½ and its consequence for mankind? Seen through the lens of prophecy, what is the significance of World War I and II? Were these birth pangs to prepare the nations for World War III and Armageddon? 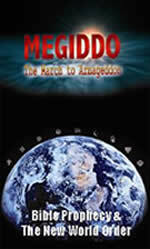 Megiddo, The March to Armageddon: By Adullam Films, Running time: 135 min.